Surely… that’s not meant to ACTUALLY be used… At least… on some level, you know what I’m trying to say right? I’ve only ever ‘collected’ a couple of pieces of makeup and when I have … I’ve bought two. One for using and one for collecting. I’d never buy something just to collect it I don’t think, I mean… I would have to want to wear it enough to want to collect it in the first place. I want to know about some of the pieces you’ve collected and if you think collecting makeup is an absurdity, tell me why – my bank balance will thank you later. I think some things are meant to be just looked at and I would love to have them but I don’t! Thats beautiful, but surely there’s only two shades in that palette? Why four pans? Anyway, make-up is to be used. I appreciate pretty packaging, but in the end I’m all about the product and if I can’t use something because its too pretty, I won’t buy it. Not really but it looks like I am collecting all the sleek makeup palettes but somehow not fussed about storm, chaos, circus, and original and won’t be getting them. Like @edenblue, if it’s too pretty i wont buy it cos i know i wont use it and feel already guilty enough not to use all my makeup. There is only a couple things I have bought and kept. First is from the MAC & Hello Kitty collection. I love HK and this was my first collection after discovering MAC, that I really wanted something. Everything is still in boxes etc. And second was my MAC GaGa lipstick. Bought 2, one to keep and one to wear. Make up palettes are nice things to collect if you’ve lots of money but if you’ve a tight budget its probably wasteful. I use everything i buy or try to anyway. packaging and cuteness would encourage me to buy and i would get a kick out of looking at the product when i’m using it. I’m such a collector! I buy the Dior LE star product from every season, which is a really bad habit as often they’re not really useful and they’re expensive, but they’re just SO PRETTY! Makeup absolutely can be collected! I don’t think it’s a waste at all, certain pieces can truly be works of art. I display them on shelves! I DO collect yes….in the sense that if i like a particular product i want it in all colours available lol. I Have never been 1 for collecting something and not touching it (kind of a waste….?) But I do occasionally get tempted lol. Ugh, yes I’m a bit of a collector. It’s just so hard to ‘ruin’ pretty imprints and stuff. I always say I’ll use the stuff I buy but then I think I should use up stuff to “deserve” it more and then they sit. I have a collection of old-style Urban Decay face case palettes. I use them all though – just, kind of, very carefully! I never got around to replying to this before… Anyway, I collect make up. I have lots of it. I even have stuff I bought with the intention of never using (usually have a back up that I do use though). I have the above eyeshadow palette (and the matching blush) and I admit I haven’t used them yet. I will, but I need time. 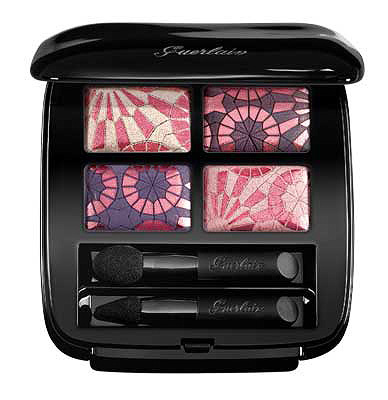 Guerlain always makes such gorgeous limited edition eyeshadows, but I always use them in the end, just try to save as much of the pretty pattern as possible. Make up has really become art, not just in applying, but presenting it, there have been so many gorgeous powders and palettes around lately, I just have to buy them all. I do use most of my make up though, so that makes me feel better about buying. Some really interesting views, thanks for the taking the time ladies! I have a couple of pieces that I collect.. and I am endlessly tempted by the Guerlain. Anitacska, you are my collecting hero – I drool when I look at your collection, just beautiful. Long may you enjoy it.